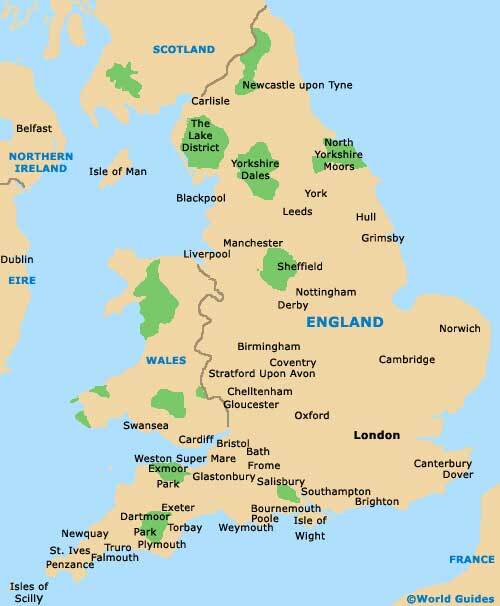 England is the largest country in the United Kingdom of Great Britain and borders Wales to the West and Scotland to the North. The English Channel and the North Sea separates England from Europe and the Irish Sea separates England from Ireland. Starting with the Roman invasion in the 1st century, England has a long and rich history that includes a long line of kings and queens and numerous battles. Tourists to England will enjoy the wealth of historic places to visit that include The Tower of London, Westminster Abbey, St. Paul's Cathedral, Stonehenge, Hadrian's Wall, and many prehistoric sights. Numerous cities of interest include London - the capital of England, steeped in history and offering an abundance of things to do; Bath, a World Heritage city - featuring the ancient Roman Baths and Royal Crescent; Oxford - famed for its university and the Bridge of Sighs; Cambridge - featuring many attractions and a world-famous university; Salisbury - with the breathtaking Salisbury Cathedral, Old Sarum Castle and Old Wardour Castle; Liverpool - now classed as a World Heritage city; York - with York Cathedral and Castle Howard; Leeds - featuring Harewood House; Brighton - including the Brighton Royal Pavilion and much more. England has a wealth of accommodation to suit all travellers including budget lodging, travel lodges, bed and breakfast and luxury hotels. Some of the most famous London hotels are now iconic landmarks in their own right, residing in vibrant inner-city districts such as Belgravia, Chelsea, Covent Garden, Mayfair and Soho. There are also some very affordable London hostels close to Greenwich, Hyde Park, King's Cross, Notting Hill, Paddington and the O2 Arena (the Millennium Dome). Places to visit in England are endless and there is something to suit everyone with blue flag beaches, national parks, theme parks, sporting venues, walking trails, museums, landmarks, monuments, festivals, carnivals and quality shopping, including the acclaimed Harrods department store in London's Knightsbridge area. Bath serves as one of the most attractive, elegant and historic cities in England, brimming with imposing architecture and lengthy Georgian streets. Roman Bath is now classed as a World Heritage City and draws crowds of summer tourists. Birmingham is the second largest city in the United Kingdom and Birmingham has a population of more than one million. With many cutting-edge redevelopments and historic architecture, Birmingham has more miles of canals than Venice. Bournemouth is best known for its spectacular golden beaches, which stretch for over 11 km / 7 miles along the seafront. The beaches, combined with sheltered, bathing waters, have always been a major tourist attraction in Bournemouth. Brighton and Hove, on the south coast of England, is a the top seaside resorts in the UK and Brighton has recently appeared in the top ten UK cities. Attracting more than 8 million tourists each year, Brighton has a major conference centre. Bristol is the largest and most lively city in the south-west of England and Bristol's waterside location, lined with historic buildings, tourist attractions, boats and restaurants make the Bristol quite unforgettable. The unique university city of Cambridge has attracts students for almost 800 years and Cambridge is a beautiful city in England. The River Cam runs through the centre of Cambridge and this is a popular place for Cambridge punting. Filled with history and incorporating plenty of 21st-century vitality, Canterbury may not be an especially large city, but is cram-packed with character. Central Canterbury is dominated by its towering cathedral, which is a good reference point. An elegant and historic Regency town, Cheltenham came to prominence some 300 years ago, when its natural spring was first discovered. Today, the Cheltenham horse racing scene is amongst the town's leading attractions. A quintessentially English city with numerous Tudor, Victorian and old half-timbered buildings, Chester really does allow you to step into the past. Roman city walls, an ancient amphitheatre, castle remains, a grand cathedral and a family zoo are the main distractions. Coventry is not one of England's most attractive cities, but it does feature a surprising amount of Georgian architecture and medieval interest. Popular historical attractions in Coventry include the remains of the city walls and gateways. Located in southern Derbyshire, the city of Derby is famed for its Royal Crown bone-china and Rolls Royce engines, as well as its shopping and sightseeing opportunities. The nearby Peak District adds to the overall appeal. Eastbourne has worked hard to shake of its reputation as being a holiday destination for pensioners and is now beginning to attract more families. The sunny beaches are accompanied by a Victorian pier and plenty of seaside attractions. A handsome university city lying within close proximity to South Devon, Exeter is filled with history and dominated by its soaring cathedral towers. Exeter's quayside offers a trendy vibe, with its warehouse eateries and waterfront bars. The market town of Frome is full of historic and was founded by St. Aldhelm in 685 AD. Frome has always been a prosperous town and gained much wealth from the wool industry in the 17th century, when Frome was larger than nearby Bath. A small and surprisingly well-known Somerset town, Glastonbury is famed for is Christian connections, spiritual legends and fascinating mythology. However, is it Glastonbury's Pop Festival that draws the biggest crowds each year. Residing in County Durham, the port town of Hartlepool has greatly invested in its future over the past few decades, reinventing itself as a leading tourist destination and actively promoting its rich maritime and seaport heritage. A vibrant riverside city with a unique Museums Quarter, Kingston Upon Hull offers a historic Old Town with cobbled alleyways and traditional pubs aplenty. Boat trips departing from Hull's Victoria Pier are always popular. The Ipswich of today is a town of modern shopping centres, listed buildings and a regenerated Wet Dock quayside. Located in Suffolk, Ipswich has grown up around the River Orwell, being close to both Felixstowe and Harwich. The Isle of Wight is the perfect place for a relaxing break at any time of the year, and the Isle of Wight's extremely mild climate is well suited to outdoor activities. These include many golf courses, yachting regattas, and boat races. The Lake District is made up of rolling Cumbrian countryside, beautiful mountains, glistening lakes and friendly historic towns. Many celebrities have called the Lake District their home, including Beatrix Potter and also William Wordsworth. Located in the north of England, Leeds is considered to be the UK's favourite city. Leeds is full of exciting places to visit, things to do, and top shopping facilities. One of the most trendy places in Leeds is the restored waterfront area. A multicultural city enjoying the results of a huge project to improve its overall tourist appeal, Leicester's Highcross shopping centre and Curve Theatre certainly stand out, along with its much-visited National Space Centre. An attractive Lincolnshire city with a rich history, Lincoln comes with much Tudor architecture and a lively Cathedral Quarter. In the heart of Lincoln, the Brayford Waterfront district is centred around a large inland marina. Liverpool, now classed as a World Heritage city, is full of culture, excitement and an important maritime history. Famous for its Mersey waterfront and The Beatles, Liverpool has recently redeveloped many areas in central Liverpool. The cosmopolitan city of London is the capital of London and its very name suggests history and grandeur. It is the premier city in Europe in terms of size, population and wealth. What strikes visitors most about London is its sheer size. A summer holiday in Lyme Regis offers all kinds of seaside fun, ranging from fossil hunting and sunbathing on its central sandy beachfront, to a historic Cobb fronting the harbour. Lyme Regis is also a good base to explore south-western Dorset. The adjacent towns of Lynton and Lynmouth are to be found on the northern coastline of Devon, standing close to Minehead and the Exmoor National Park. Dating back to 1890, a ride on the historic Cliff Railway is a real must. Known as the capital of the north, Manchester is one of England's leading cities and Manchester was actually the world's first industrial city. Manchester has many architectural showpieces, including Manchester's new £150 million glass tower. Occupying the south-western corner of Hampshire, the New Forest National Park boasts rolling countryside, endless heathland and wild ponies. The towns of Brockenhurst, Lyndhurst and Lymington are central to local life. Newcastle has recently been voted the UK's best short break destinations and Newcastle is considered one of the world's new cultural Meccas, with many attractions. Newcastle city has more listed buildings than any other UK city. Located in Norfolk / East Anglia, the city of Norwich offers an interesting medieval past and lots of character, provided by its plentiful half-timbered buildings. The city's most important buildings are known as the 'Norwich 12'. The city of Nottingham is a surprising city and tourists will discover a thriving fashion industry, some leading entertainment venues, clubs and a superb shopping scene. Nottingham is also extremely proud of its Robin Hood heritage. The university city of Oxford is a beautiful, compact city, full of medieval gems, historic buildings and one of the world's most highly regarded universities. Oxford has many areas of green and a mixture of shops, bars and restaurants. Frequently referred to as the shopping capital of Cambridgeshire, Peterborough is home to the malls of Queensgate, Serpentine Green and Rivergate. The historic Cathedral Precinct adds much interest for sightseers. Offering a rich maritime history and known for its association with Sir Francis Drake, Plymouth is Devon's largest city and resides in the south-westerly region of England. The Plymouth Hoe and the historic Barbican area are particular highlights. The medieval port of Poole is situated next to the sea and is full of tourist attractions and activities, such as the famous Poole Pottery. These tourist attractions also include Poole Harbour and the Sandbanks peninsula. The Hampshire city of Portsmouth has enjoyed strong links to the Royal Navy for literally centuries. Tourists will be drawn by the maritime attractions of the Historic Dockyard, where guided tours of Nelson's HMS Victory are unmissable. Salisbury is the only city in Wiltshire and contains some of the most historic landmarks in England. These landmarks include Salisbury's renowned Stonehenge, on Salisbury Plain, and the vast Salisbury Cathedral. History remembers Scarborough as being the spot where the traditional British seaside summer holiday was born. Lying on the north-eastern coast of Yorkshire, Scarborough is very much a family resort with classic seaside-themed attractions. Still very much associated with the award-winning movie 'The Full Monty', Sheffield boasts everything from botanical gardens to leading sporting venues. Sheffield is actually England's fourth-largest city and contains no less than two universities. Well known for its waterfront setting next to the Solent inlet, Southampton is a busy city with an interesting shipbuilding past. The shopping scene in Southampton is exceptional, particularly around the Bargate and West Quay areas. The renowned Staffordshire pottery manufacturers of Stoke on Trent have brought much fame and fortune to this collection of towns. Hanley forms the centre of Stoke on Trent, while the Alton Towers theme park is nearby. Tourists heading for Stratford upon Avon should prepare themselves for a real treat. This colourful market town is filled with Shakespeare memorabilia, since it was in Stratford upon Avon where this famed Elizabethan playwright was born. Sunderland was once a city of industry, with bustling docks and productive coal mines. Nowadays, the appearance of Sunderland is quite different. This is now a modern city with attractive coastal scenery and some easily accessible beaches. A gateway town on England's celebrated Jurassic Coast, Swanage lives in the county of Dorset, where it has been a popular seaside resort ever since the Victorian era. The sandy beachfront of Swanage is a real draw for families. Torbay is based around a large natural harbour and comprises the towns of Brixham, Paignton and Torquay. Beaches, seafront promenades, zoos and a steam railway are accompanied by an intriguing Agatha Christie legacy. A traditional seaside town close to Bristol, Weston Super Mare is a true tourist hot spot in the summer months, although is quite deserted out of season. Weston Super Mare's beach and pier are where the main attractions are gathered. A busy port in medieval times, Weymouth is sited on England's southerly coastline and this town has been popular with tourists since Victorian times. The Esplanade borders Weymouth's seafront and connects most places of interest. Regarded as being one of the most appealing places to live in the whole of England, a trip to Winchester will be a true high point for any holiday in Hampshire. Winchester's enormous cathedral presides over the city centre, being impossible to miss. A relatively small and perfectly formed Worcestershire city, Worcester has plenty to shout about. The porcelain china known as Royal Worcester began its life here in the mid-18th century and certainly put this city on the map. The Viking city of York is one of north-England's most compelling cities and is home to a wealth of culture and history. York's medieval streets are surrounded by the 13th-century York Walls. In York city centre lies the magnificent York Minster.